The Naturalest Naturalist: Gulling Season! I suppose I have better things to write about in the local birding world, but I like gulls. Sure we just had a mega rarity turned rare hybrid but my photos were lousy and I'd rather procrastinate on it and eventually forget to even write about it. On Sunday, I relaxed for a good portion of the day and then finally made a break for it just after noon. I started by thinking I would be scanning through flooded field waterfowl, but the number of gulls on the fields drew me in to their web of seduction. When the herring spawn is starting up in the inside passage, we get a lot of gulls moving through. What you really notice first is the increased presence of California Gulls. 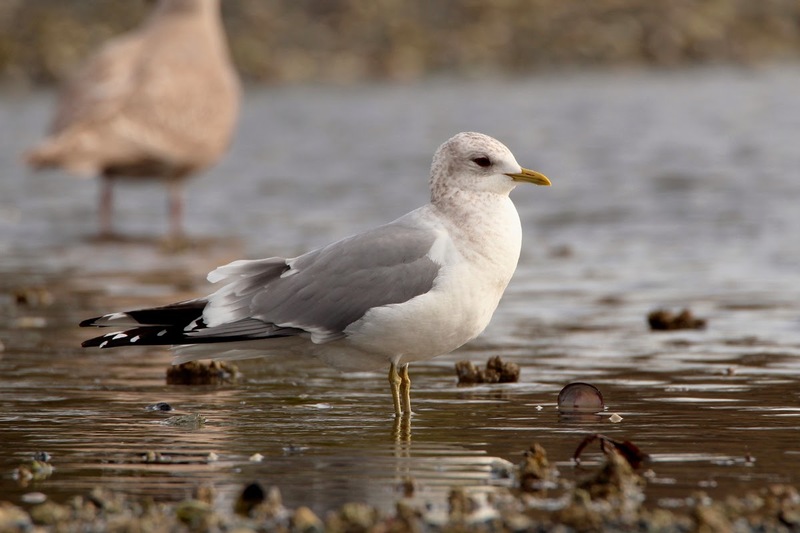 We get California Gulls right through the winter, but you really notice the fresh batch moving through because some are in breeding plumage with school bus yellow legs. The ones that stay through the winter look pretty pallid in comparison. The fields just east of the village of Brentwood Bay were bustling with activity and one gull in particular caught my attention. In Victoria, American Herring Gulls - I like the splitter's taxonomy - are not exactly unusual but they're certainly not easy to find either. One a muddy field at the end of Columbia Ave., I found a second-winter American Herring Gull and it happened to be one of the closest birds. I fired off many shots and I picked out one for you to see this cold-eyed and striking individual. 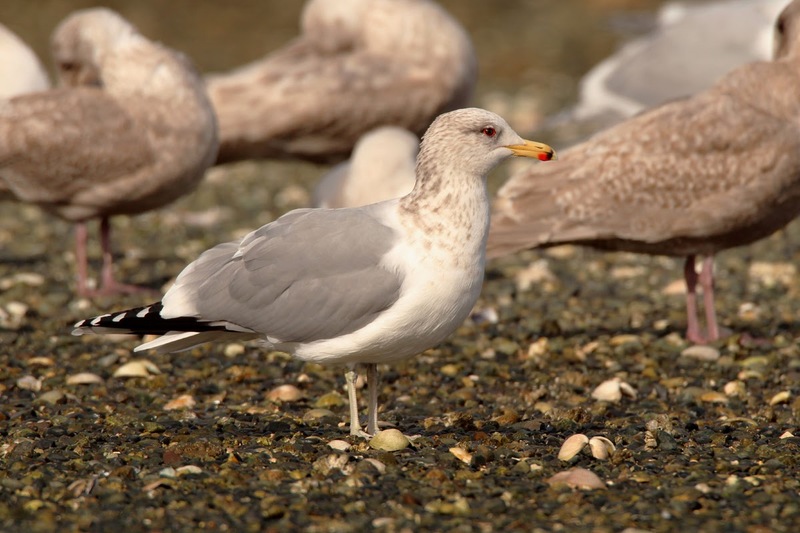 The combination of the slightly heavy bill, near-black primaries, pale iris, and silvery mantle are indicative of American Herring Gull (Larus smithsonianus). After enjoying the gulls in Brentwood, I zipped out to Patricia Bay to see if any Glaucous Gulls happened to be mixed in with the gulls at the mouth of Wsikem Creek. Not this time, but I took the time to photograph adult Mew and California Gulls in winter plumage. 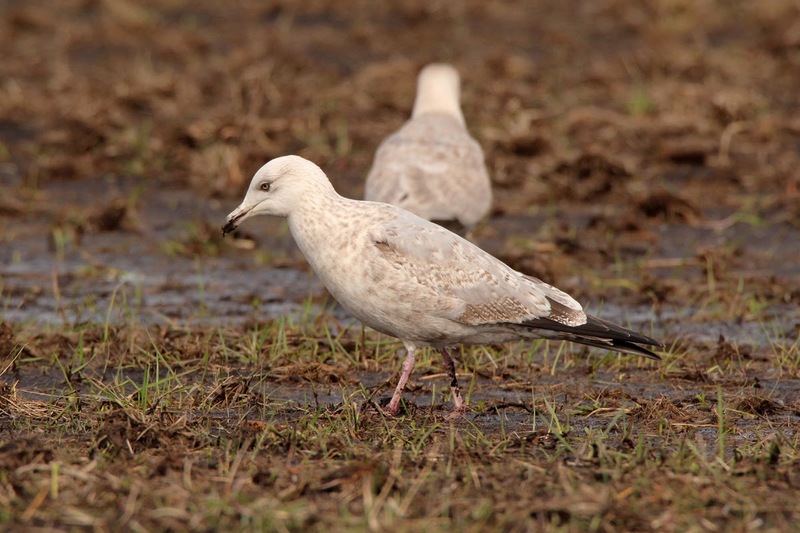 I also photographed a first-winter Glaucous-winged Gull that is starting to get pretty washed out. 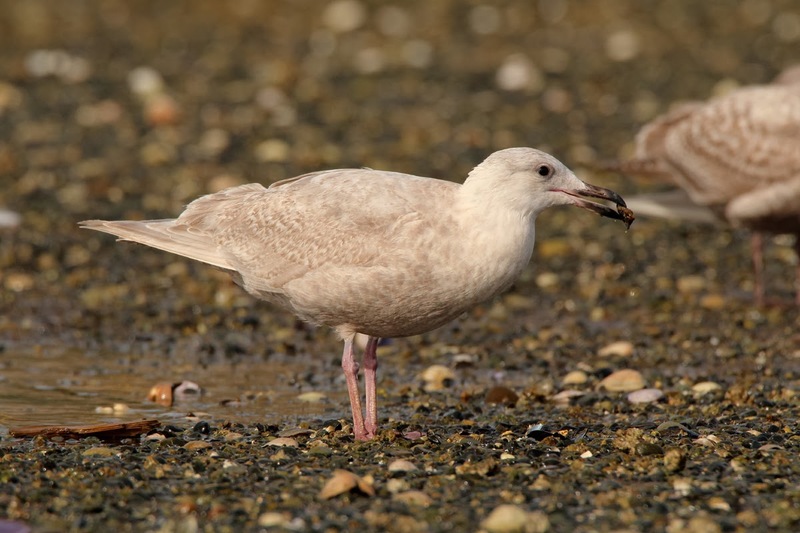 As these second calendar-year birds get more worn and bleached out, they begin to superficially resemble a Glaucous Gull. These fool quite a few birders every year! Mew Gull is not even arguably the cutest gull... it just is, hands down! The wingtips are not quite fully bleached out yet, but this first-winter Glaucous-winged Gull is getting pretty hyperboreal! Hopefully the wave of gulls passing through for the spawn deposits an outlandishly dark-backed gull in my path. I'll be out this weekend looking and will try to get more good photos... especially if there is a Slaty-backed involved!